Just over two months ago, I decided to start working full-time as an author, self-publishing novels on Amazon KDP. As you can imagine, since making that decision, I’ve been getting up at noon, milling around in fields, and occasionally jotting down the odd sentence with a quill while my bank balance has risen without me ever having to put in any real effort. Yes – that was sarcasm. Although the stereotype of writers being lazy people may be justified in some cases, serious writers like myself actually have to do a ton of work if they want to be successful. A lot of their tasks aren’t even necessarily related to writing their next bestseller. Now, I don’t claim to be the definitive publishing expert yet – like I said, my career is still in its early stages – but I do take writing seriously, and I have researched other successful writers before I started. That way, learn from them and maximise my chances of success. 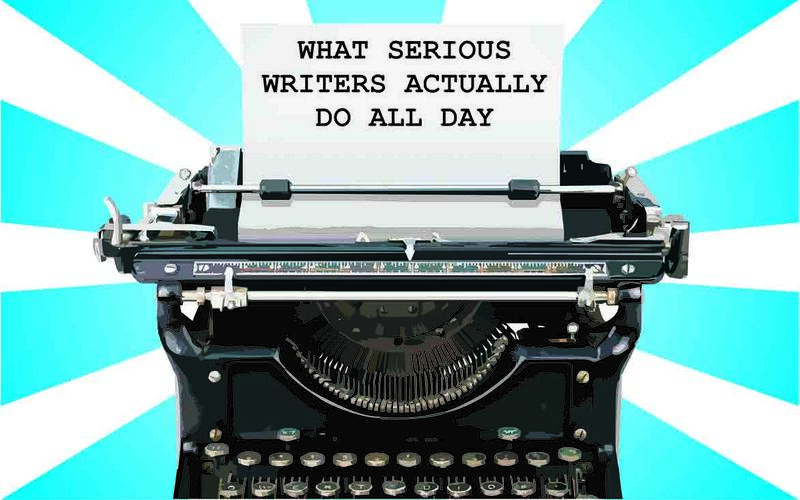 Below, I’ve compiled a list of six things serious writers do to fill their day. Hopefully, this will debunk the myth of the lazy writer forever and offer tips to new writers who want to improve the way they’re working. This seems like an obvious one but it’s surprising how many writers struggle to realise the importance of writing. Competitive writers don’t wait for inspiration to strike. They actively crank out titles on a regular basis. Growing and Maintaining a Social Media Presence. I’m a big believer in the power of social media. When I released my debut eBook The Winter Freak Show, I had no previous readership and no publishing contacts. However, by solely advertising to my then 10,000 Twitter followers, I managed to get a few hundred sales in the UK, USA, Germany, Japan, Canada, and Australia during its release week, establishing an initial readership that I wouldn’t have had if it wasn’t for social media. Spending an hour per day on social media can drastically improve a writer’s success, particularly in their early days. If you want to read about the benefits of having a website/blog, see my last post, ‘5 Reasons Why Authors Need a Website’. Not only do websites make writers look more professional, they also increase their capabilities for search engine optimisation. Writing short, engaging blog posts on a monthly basis will keep people interested in what you have to say. Also, maintaining a stylish, up-to-date website portrays a writer as a more attractive business opportunity to publishers and literary agents. Think of your website as your shop window. Spending some time on its maintenance is a no-brainer! Submitting to Agents and/or Publishers. Studies have shown that writers tend to be more successful if they mix self-publishing with traditional publishing deals, catering to two different markets. That’s why many serious self-published writers spend a portion of their day applying to publishers. Likewise, agents have a lot of influence and can get writers opportunities that they may otherwise never get on their own. So it makes sense that serious writers apply to agents regularly until they find one that is compatible with their personality and ambitions. Realistically, that’s the only way to get your work translated into other languages and gain movie adaptations. Whether they’re organising school talks, writing workshops, blog tours or book signings, many writers recommend organising events regularly. They create opportunities to promote their books to new readers, and offer chances to interact with industry professionals. Remember, readers feel more inclined to support someone if they’ve actually met them in real life. Not only that, writers can often gain extra income from public appearances. That’s why some time each week should be dedicated to the task of organising events. Liaising with other publishing professionals can be fun, interesting, and – in most cases – beneficial to your career. Usually, this is achieved at book fairs and festivals. You could even go along to another local writer’s event and make friends. Not only does it make the solitary writer’s lifestyle more sociable, but it also leads to future opportunities. Most serious writers like networking, and consider it a crucial part of their schedule. Hopefully, this blog post has debunked the myth of the lazy writer, showing that, normally, writing is a 24/7 job. Competitive writers work hard to get to the top of the bestsellers list and stay there. Ideas arrive like epiphanies in the middle of the night. Unexpected opportunities show up and they have to grab them while they exist. As Tyler Durden said in Fight Club, ‘You are not a unique snowflake’. If writers don’t work hard then others will outpace them and they will simply be forgotten.